This stereo view combines a pair of images taken two months apart by the microscopic imager on NASA's Mars Exploration Rover Spirit. Rover team members used the microscopic imager on the rover's arm to accomplish something never intended during the design of the rover or that camera -- getting a look underneath the rover. They did so to get a better understanding of Spirit's predicament, with wheels embedded deeply enough in soft soil at a site called "Troy" for the rover to be at risk of getting hung up on a rock under the rover. The dark triangular shape is a rock that is either touching or nearly touching Spirit's underbelly. 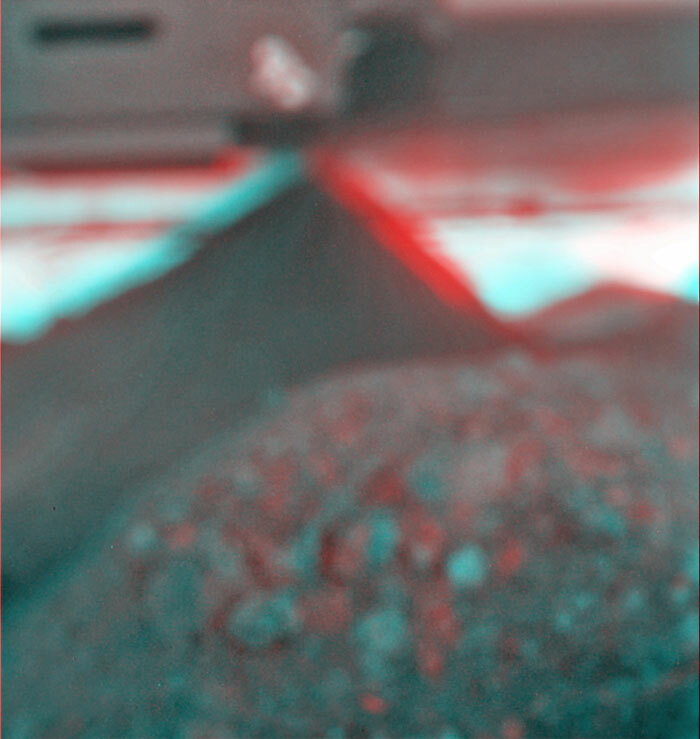 The two images combined here come from two camera positions, one slightly to left of the other, yielding a three-dimensional view when seen through red and blue glasses with the red lens on the left. The microscopic imager took one of the pair during Sol (Martian day) 1925 of Spirit's mission on Mars (June 2, 2009) and the other during Sol 1990 (Aug. 8, 2009). The team had not commanded any driving moves by Spirit in the interim while it was running experiments with a test rover on Earth to evaluate possible maneuvers for getting Spirit away from Troy. The microscopic imager is designed to focus on rock or soil targets 6 centimeters (2.4 inches) away. It rides on the end of the rover's robotic arm so that it can be placed close to targets for inspection. It cannot focus on objects as far away as the rover underbelly and rocks that are visible in this image despite being out of focus. The team has used this image as an aid in planning a drive strategy for Spirit. The rock underneath presents a risk of high-centering the rover if the wheels sink much further into the soil. This stereo scene combines frames taken by the navigation camera on NASA's Mars Exploration Rover Spirit during the 1,866th Martian day, or sol, of Spirit's mission on Mars (April 3, 2009). It spans 120 degrees, with south at the center. The view appears three-dimensional when viewed through red-blue glasses with the red lens on the left. Spirit had driven 3 meters (10 feet) southward earlier in the day. The foreground of this view includes terrain that the rover covered in its next drive, when it progressed 17.5 meters (57 feet) farther southward on Sol 1868 (April 5, 2009). In the middle distance, the western edge of the low plateau called "Home Plate" is on the left and a ridge called "Tsiolkovsky" is on the right, with the rover's planned route between the two. By Sol 1899 (May 6, 2009) Spirit became embedded at a site dubbed "Troy," about as far south as the northern end of Tsiolkovsky. This scene combines right-eye and left-eye views presented as cylindrical-perspective projections with geometric seam correction. This stereo scene combines frames taken by the navigation camera on NASA's Mars Exploration Rover Spirit during the 1,869th Martian day, or sol, of Spirit's mission on Mars (April 6, 2009). It spans 120 degrees, with south at the center. The view appears three-dimensional when viewed through red-blue glasses with the red lens on the left. The view is from the position Spirit reached with a 17.5-meter (57-foot) southward drive on the preceding sol. The foreground includes terrain that the rover covered in its next two drives, when it traveled 12.7 meters (42 feet) southward on Sol 1870 (April 7, 2009) and an additional 7 meters (23 feet) on Sol 1871 (April 8, 2009). On the far left of the image is the slope of the western edge of the low plateau called "Home Plate." On the right, in the middle distance, is a ridge called "Tsiolkovsky." Behind the saddle between Home Plate and Tsiolkovsky is a mound capped with light-toned rock and called "Von Braun," a possible destination for Spirit to investigate in the future. Spirit was driving toward Von Braun when the rover became embedded in soft soil at a site called "Troy" by Sol 1899 (May 6, 2009). The soft soil at Troy was covered with a darker layer before Spirit's wheels broke through that top layer and revealed lighter material, so the site is inconspicuous in the middle distance toward Von Braun in this image. This stereo scene combines frames taken by the navigation camera on NASA's Mars Exploration Rover Spirit during the 1,871st Martian day, or sol, of Spirit's mission on Mars (April 8, 2009). It spans 180 degrees, with east on the left, south at the center and west on the right. The view appears three-dimensional when viewed through red-blue glasses with the red lens on the left. This view is from the position Spirit reached with a drive of 7 meters (23 feet) southeastward earlier on Sol 1871. The drive brought Spirit to within about 2 meters (7 feet) of the location, subsequently dubbed "Troy," where it would begin to become embedded after its next drive. Other issues, including an amnesia-like event and unexplained computer resets, resulted in no driving attempts after Sol 1871 until Sol 1886 (April 23, 2009). The western edge of the low plateau called "Home Plate" appears on the left side of this view. A ridge informally named "Tsiolkovsky" is on the right. Behind the saddle between Home Plate and Tsiolkovsky is a mound capped with light-toned rock and called "Von Braun," a possible destination for Spirit to investigate in the future. Spirit was driving toward Von Braun when the rover became embedded in soft soil at a site called "Troy" by Sol 1899 (May 6, 2009). The soft soil at Troy was covered with a darker layer before Spirit's wheels broke through that top layer and revealed lighter material. This stereo scene combines frames taken by the navigation camera on NASA's Mars Exploration Rover Spirit during the 1,891st Martian day, or sol, of Spirit's mission on Mars (April 28, 2009). It covers a vista from south-southeast on the left to northeast on the right. The view appears three-dimensional when viewed through red-blue glasses with the red lens on the left. This view is from the position Spirit reached with a drive that moved the rover only about 14 centimeters (5.5 inches) earlier on Sol 1891. Spirit's wheels had started to sink into local soil on Sol 1886 (April 23, 2009). After Sol 1891, the rover team attempted five more drives with Spirit through Sol 1899 (May 6, 2009), moving the rover only a few centimeters in all, and detecting wheel slippage in excess of 99 percent before deciding to suspend further driving by Spirit until potential maneuvers had been thoroughly evaluated with a test rover on Earth. The site from which Spirit obtained this view has been informally named "Troy." Layers of differently hued soil uncovered by the sinking wheels became the subject of intense analysis by the instruments on Spirit's robotic arm. On the horizon at the left edge of this view is a mound capped with light-toned rock and called "Von Braun," a possible destination for Spirit to investigate in the future. Between Von Braun and the center of the image is a ridge called "Tsiolkovsky." The hill on the horizon to the right is Husband Hill, where Spirit reached the summit in 2005. Tracks receding toward the north were created as Spirit drove southward toward Troy, driving backward and dragging its right-front wheel, which has been inoperable for more than three years. For scale, the distance between the parallel wheel tracks is about 1 meter (about 40 inches). This panorama combines right-eye and left-eye views presented as cylindrical-perspective projections with geometric seam correction. NASA's Mars Exploration Rover Spirit used its navigation camera to take the images that have been combined into this stereo, 180-degree view of the rover's surroundings during the 1,823rd Martian day, or sol, of Spirit's surface mission (Feb. 17, 2009). The center of the view is toward the south-southwest. The rover had driven 7 meters (23 feet) eastward earlier on Sol 1823, part of maneuvering to get Spirit into a favorable position for climbing onto the low plateau called "Home Plate." However, after two driving attempts with negligible progress during the following three sols, the rover team changed its strategy for getting to destinations south of Home Plate. The team decided to drive Spirit at least partway around Home Plate, instead of ascending the northern edge and taking a shorter route across the top of the plateau. Layered rocks forming part of the northern edge of Home Plate can be seen near the center of the image. Rover wheel tracks are visible at the lower edge. NASA's Mars Exploration Rover Spirit used its navigation camera to take the images that have been combined into this stereo, full-circle view of the rover's surroundings during the 1,843rd Martian day, or sol, of Spirit's surface mission (March 10, 2009). South is in the middle. North is at both ends. The rover had driven 36 centimeters downhill earlier on Sol 1854, but had not been able to get free of ruts in soft material that had become an obstacle to getting around the northeastern corner of the low plateau called "Home Plate." NASA's Mars Exploration Rover Spirit used its navigation camera to take the images combined into this stereo, 210-degree view of the rover's surroundings during the 1,861st to 1,863rd Martian days, or sols, of Spirit's surface mission (March 28 to 30, 2009). The center of the scene is toward the south-southwest. East is on the left. West-northwest is on the right. The rover had driven 22.7 meters (74 feet) southwestward on Sol 1861 before beginning to take the frames in this view. The drive brought Spirit past the northwestern corner of Home Plate. In this view, the western edge of Home Plate is on the portion of the horizon farthest to the left. A mound in middle distance near the center of the view is called "Tsiolkovsky" and is about 40 meters (about 130 feet) from the rover's position. NASA's Mars Exploration Rover Spirit used its navigation camera to take the images that have been combined into this stereo, 180-degree view of the rover's surroundings during the 1,854th Martian day, or sol, of Spirit's surface mission (March 21, 2009). The rover had driven 13.79 meters (45 feet) westward earlier on Sol 1854. West is at the center, where a dust devil is visible in the distance. North on the right, where Husband Hill dominates the horizon; Spirit was on top of Husband Hill in September and October 2005. South is on the left, where lighter-toned rock lines the edge of the low plateau called "Home Plate." NASA's Mars Exploration Rover Spirit used its navigation camera to take the images that have been combined into this stereo, 180-degree view of the rover's surroundings during the 1,856th Martian day, or sol, of Spirit's surface mission (March 23, 2009). The center of the view is toward the west-southwest. The rover had driven 25.82 meters (84.7 feet) west-northwestward earlier on Sol 1856. This is the longest drive on Mars so far by a rover using only five wheels. Spirit lost the use of its right-front wheel in March 2006. Before Sol 1856, the farthest Spirit had covered in a single sol's five-wheel drive was 24.83 meters (81.5 feet), on Sol 1363 (Nov. 3, 2007). The Sol 1856 drive made progress on a route planned for taking Spirit around the western side of the low plateau called "Home Plate." A portion of the northwestern edge of Home Plate is prominent in the left quarter of this image, toward the south. NASA Mars Exploration Rover Spirit used its navigation camera to take the images assembled into this stereo, 120-degree view southward after a short drive during the 1,809th Martian day, or sol, of Spirit's mission on the surface of Mars (February 3, 2009). By combining images from the left-eye and right-eye sides of the navigation camera, the view appears three-dimensional when viewed through red-blue glasses with the red lens on the left. Spirit had driven about 2.6 meters (8.5 feet) that sol, continuing a clockwise route around a low plateau called "Home Plate." In this image, the rocks visible above the rovers' solar panels are on the slope at the northern edge of Home Plate. NASA Mars Exploration Rover Spirit used its navigation camera for the images assembled into this stereo, full-circle view of the rover's surroundings during the 1,802nd Martian day, or sol, (January 26, 2009) of Spirit's mission on the surface of Mars. South is at the center; north is at both ends. Spirit had driven down off the low plateau called "Home Plate" on Sol 1782 (January 6, 2009) after spending 12 months on a north-facing slope on the northern edge of Home Plate. The position on the slope tilted Spirit's solar panels toward the sun, enabling the rover to generate enough electricity to survive its third Martian winter. Tracks on the right-hand side of this panorama can be seen leading back to that "Winter Haven 3" site from the Sol 1802 position about 10 meters (33 feet) away. For scale, the distance between the parallel wheel tracks is about one meter (40 inches). Where the receding tracks bend to the left, a circular pattern resulted from Spirit turning in place at a soil target informally named "Stapledon" after William Olaf Stapledon, a British philosopher and science-fiction author who lived from 1886 to 1950. Scientists on the rover team suspected that the soil in that area might have a high concentration of silica, resembling a high-silica soil patch discovered east of Home Plate in 2007. Bright material visible in the track furthest to the right was examined with Spirit's alpha partical X-ray spectrometer and found, indeed, to be rich in silica. The team laid plans to drive Spirit from this Sol 1802 location back up onto Home Plate, then southward for the rover's summer field season.